Anne-Sophie Mutter is a musical phenomenon: for more than 40 years the virtuoso has now been a fixture in all the world’s major concert halls, making her mark on the classical music scene as a soloist, mentor and visionary. The four-time Grammy® Award winner is equally committed to the performance of traditional composers as to the future of music: so far she has given world premieres of 28 works – Unsuk Chin, Sebastian Currier, Henri Dutilleux, Sofia Gubaidulina, Witold Lutoslawski, Norbert Moret, Krzysztof Penderecki, Sir André Previn, Wolfgang Rihm and John Williams have all composed for Anne-Sophie Mutter. Furthermore, she dedicates herself to numerous benefit projects and to supporting tomorrow’s musical elite: in the autumn of 1997 she founded the Association of Friends of the Anne-Sophie Mutter Foundation e.V., to which the Anne-Sophie Mutter Foundation was added in 2008. These two charitable institutions provide support for the scholarship recipients, support which is tailored to the fellows’ individual needs. Since 2011, Anne-Sophie Mutter has regularly shared the spotlight on stage with her ensemble of fellows, Mutter’s Virtuosi. Anne-Sophie Mutter’s 2019 concert calendar features performances in Asia, Europe, North and South America, once again reflecting the violinist’s musical versatility and her unparalleled prominence in the world of classical music: in March she will perform the world premiere Sebastian Currier’s Ghost Trio at Carnegie Hall. In Beijing, she will give the world premiere of Jörg Widmann’s String Quartet – both new works were commissioned by her and are dedicated to the violinist. In September she will perform for the first time in her career as part of an open-air concert. Entitled Across the Stars, this event features some of the most outstanding works by John Williams, who has won several Oscars for his compositions, and takes place on Munich’s Königsplatz. Most of the works on this open-air programme are special arrangements made for Mutter. July sees the release of her CD recording of this new Williams repertoire, which has not been heard in this form anywhere else so far. Another thematic focus in 2019 are the violin concerti by Wolfgang Amadeus Mozart, which she performs throughout Europe and in the USA. In South America and in Europe, she appears with the West-Eastern Divan Orchestra and plays the Beethoven Triple Concerto with Daniel Barenboim and Yo-Yo Ma – an extraordinary cast. Together with “Mutter’s Virtuosi”, the ensemble of the Anne-Sophie Mutter Foundation, she performs for the first time in South America. Anne-Sophie Mutter begins the year 2019 with Bach’s Concerto for Two Violins BWV 1043: during the gala concert commemorating the 20th anniversary of the Oxford Philharmonic Orchestra, she performs it together with Maxim Vengerov conducts; Marios Papdopoulos conducts. This work, equally beloved by musicians and audiences, was recorded by Anne-Sophie Mutter twice: in 1983 with Salvatore Accardo and the English Chamber Orchestra and in 2015 for Anne-Sophie Mutter – Live from Yellow Lounge, her Berlin club performance. In March, Mutter tours the USA and Canada, where she begins the 31st year of her collaboration with pianist Lambert Orkis. The programme features works by Debussy, Mozart, Poulenc and Ravel. The highlight of the recital tour will be a concert at Carnegie Hall on March 12 featuring a world premiere: For the Ghost Trio by Sebastian Currier, Mutter and Orkis are joined by cellist Daniel Müller-Schott – who was a fellow of her Foundation between 1997 and 2001. In Chicago, the musicians juxtapose Beethoven’s Ghost Trio in D-major Op. 70/1 with Currier’s Ghost Trio – in addition to violin sonatas by Mozart, Poulenc and Ravel. Mutter and Orkis have not only been performing together in the world’s leading concert halls since 1988, they have also produced numerous CDs for the label Deutsche Grammophon. Their joint recording of Beethoven’s sonatas for piano and violin won a Grammy Award, for example. In commemoration of the silver jubilee of the two exceptional musicians, a double CD with samples of the two exceptional musicians’ repertoire was released in 2014. In May and June, Mozart’s Violin Concerti Nos. 2 (D-major, K. 211), 3 (G-major, K. 216) and 5 (A-major, K. 2019) are the focus of attention: as part of an extensive tour, Mutter performs with the Chamber Orchestra Vienna-Berlin in Germany, Greece, Luxembourg, Austria, Switzerland, Slovakia and Spain as well as the USA. Mutter fell in love with Mozart’s music when she was six years old. Three years later, she made her debut with a provincial orchestra. However, one of the earliest highlights of her career was her performance of the G-major Concerto under Herbert von Karajan’s baton when Anne-Sophie Mutter was thirteen. In 1978 her recording of the Violin Concerti Nos. 3 and 5 with the Berlin Philharmonic and von Karajan was released. In 2018 – commemorating the 40-year anniversary of this first recording she made for Deutsche Grammophon – the label released the audiophile deluxe edition The Early Years: the analogous tapes were remastered; the high-resolution audio format 2.0 24bit/192kHz allows the listener to experience the violinist as if she were standing right there. Mutter first recorded the Mozart Violin Concerto No. 1 in 1991 – with the Academy of St Martin in the Fields under Neville Mariner. On the occasion of Mozart’s 250th birthday in 2006, Mutter presented new recordings of the tour programme – with the London Philharmonic Orchestra under her own musical leadership. At the Tanglewood Festival, Mutter gives two concerts: on July 6 she plays Sir André Previn’s violin concerto Anne-Sophie in a concert celebrating the composer’s 90th birthday. Her musical partners are the Boston Symphony Orchestra and Andris Nelsons. Previn conducted the world premiere of the work in March 2002, which also featured the violinist and the Boston Symphony Orchestra; a recording of the concerto in this constellation is available on CD. On July 7, the violinist gives her first “Across the Stars” concert in Tanglewood. David Newman conducts the Boston Pops Orchestra in some of the most outstanding works by John Williams, composer and repeated Oscar winner. The programme features works from Star Wars, Schindler’s List, The Geisha, Harry Potter, Dracula and Munich – among others. “Most of the works are special arrangements for me – they are brand-new and have never been heard in this form,” Mutter explains. Another premiere in Mutter’s 2019 concert calendar is her collaboration with the West-Eastern Divan Orchestra under the baton of Daniel Barenboim: during its appearances in Buenos Aires, Salzburg and Lucerne, the violinist plays Jean Sibelius’ Violin Concerto. This 20th-century classic was recorded by Anne-Sophie Mutter with the Staatskapelle Dresden under the baton of Sir André Previn. On September 14, Mutter performs an open-air concert for the first time in her career. Before the backdrop of Munich’s Königsplatz, works by John Williams are on the programme entitled “Across the Stars”. Anne-Sophie Mutter will be accompanied by the Royal Philharmonic Orchestra from London, conducted by David Newman. As at Tanglewood on July 7, the repertoire consists of arrangements written especially for Mutter – including music from Star Wars, Schindler’s List, The Geisha, Harry Potter, Dracula and Munich. Anne-Sophie Mutter begins her commemoration of Beethoven’s 250th birthday in 2020 by playing his Violin Concerto. In September 2019, she performs this milestone of the violin repertoire in Montréal and Cincinnati – with the Orchestre symphonique de Montréal under the baton of Cristian Macelaru and with the Cincinnati Symphony Orchestra under Ein Sun Kim. Recordings of this work by the violinist were made both with Herbert von Karajan and the Berlin Philharmonic and with Kurt Masur and the New York Philharmonic Orchestra. Opening the 2019/2020 season at Carnegie Hall, Mutter performs Beethoven’s Triple Concerto together with pianist Yefim Bronfman and cellist Lynn Harrell, accompanied by the Cleveland Orchestra under Franz Welser-Möst. In Cologne, Paris and Berlin, Mutter will also perform the Beethoven Triple Concerto – with Daniel Barenboim at the piano, who also conducts the West-Eastern Divan Orchestra, and cellist Yo-Yo Ma. In October and November, Anne-Sophie Mutter embarks upon her sixth tour with the exclusive soloist ensemble of her Foundation – Mutter’s Virtuosi travel through South America for the first time, making concert stops in Buenos Aires, Frutillar, Santiago, Lima, Bogotá and Mexico City. Anne-Sophie Mutter completes her concert calendar for 2019 with music by Beethoven as well, offering a glimpse of the composer’s anniversary year to come at the same time: she performs the Violin Sonatas No. 4 in A-major Op. 23, No. 5 in F-major Op. 24 (“Spring Sonata”) and No. 9 in A-major Op. 47 (“Kreutzer”) with Lambert Orkis in China, Korea and Taiwan. In Beijing, Mutter gives four concerts with different Beethoven works: apart from the above-mentioned sonatas, she will perform the Triple Concerto with Khatia Buniatishvili and Daniel Müller-Schott; this is followed by the Violin Concerto, the Romances No. 1 in G-major Op. 40 and No. 2 in F-major Op. 50, and a chamber music evening: on December 8, she performs the String Trio in E-flat-major Op. 3 and the String Quartet in E-flat-major Op. 74 (“Harp Quartet”) with Wei Lu (violin), Vladimir Babeshko (viola) and Daniel Müller-Schott (cello). The three string players are former fellows of the Anne-Sophie Mutter Foundation. On this evening, the musicians also introduce the audience to new musical territory: for the first time, they will hear the String Quartet by Jörg Widmann, which the composer dedicated to the violinist. For her numerous recordings, Anne-Sophie Mutter has received four Grammies®, nine Echo Classic Awards, the German Recording Award, the Record Academy Prize, the Grand Prix du Disque and the International Phono Award. On the occasion of Wolfgang Amadeus Mozart’s 250th birthday in 2006, Anne-Sophie Mutter presented new recordings of Mozart’s complete major compositions for violin. In September 2008 her recording of Gubaidulina’s Violin Concerto In tempus praesens as well as the Bach Violin Concerti in A-Minor and E-Major was released. During the Mendelssohn anniversary year of 2009, Anne-Sophie Mutter paid very personal homage to the composer, uniting solo concerto repertoire and chamber music on CD and DVD: the Violin Sonata in F-Major written in 1838, the Piano Trio in D-Minor completed a year later, and the Violin Concerto in E-Minor of 1845. March 2010 saw the release of Anne-Sophie Mutter’s recording of the Brahms Violin Sonatas, performed with Lambert Orkis. For her 35-year stage anniversary in 2011, Deutsche Grammophon released a comprehensive box set with all of the artist’s DG recordings, extensive documentary material and as-yet unpublished rarities. At the same time, an album of first recordings of pieces dedicated to the violinist by Wolfgang Rihm, Sebastian Currier and Krzysztof Penderecki appeared. In October 2013 Anne-Sophie Mutter presented her first recording of the Dvořák Violin Concerto with conductor Manfred Honeck and the Berlin Philharmonic. In May 2014 a double CD with recordings by Mutter and Orkis followed, commemorating the 25th anniversary of their collaboration: The Silver Album featuring the first recordings of Penderecki’s La Follia and Previn’s Violin Sonata No. 2. The live recording Anne-Sophie Mutter – Live from Yellow Lounge of her club performance in Berlin was released on CD, vinyl, DVD and Blu-ray disc in 2015. This was the first live recording ever from a Yellow Lounge. On the podium at Neue Heimat Berlin, Anne-Sophie Mutter was joined by her long-standing piano accompanist Lambert Orkis, “Mutter’s Virtuosi” and the harpsichordist Mahan Esfahani. The programme covered three centuries of classical music – from Johann Sebastian Bach and Antonio Vivaldi to George Gershwin and John Williams – a combination chosen especially by Anne-Sophie Mutter for the club evenings. Commemorating the 40-year stage anniversary of the charismatic artist, Deutsche Grammophon assembled the double CD Mutterissimo – The Art of Anne-Sophie Mutter, released in 2016. It assembles the highlights of her multi-faceted discography – personally selected by Anne-Sophie Mutter herself and focusing primarily on the past two decades of her impressive career. In November 2017, Anne-Sophie Mutter and Daniil Trifonov released their first joint album, focusing on one of the most famous work in all the classical repertoire. Together with Hwayoon Lee, Maximilian Hornung and Roman Patkoló, they recorded Schubert’s Piano Quintet in A-major, generally known as the “Trout Quintet”. The programme also included Schubert’s Notturno, a masterful late work for violin, cello and piano, as well as his songs Ständchen and Ave Maria, arranged for violin and piano. Krzysztof Penderecki’s 85th birthday was honoured by Deutsche Grammophon in 2018 with a double album including all the works he has dedicated to Anne-Sophie Mutter, including her first recording of the Sonata for Violin and Piano No. 2: a sensitive and touching homage by the violinist to her musical friend and companion. 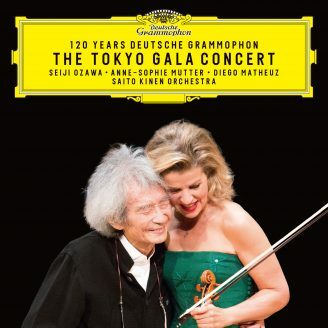 In 2018, Deutsche Grammophon also commemorated the 40-year anniversary of Anne-Sophie Mutter’s first recording by re-releasing her earliest concerto recordings in a deluxe hardcover edition entitled The Early Years – featuring violin concerti by Mozart (Nos. 3 and 5), Beethoven, Bruch and Mendelssohn. Thanks to the new, high-resolution audio format 2.2 24bit/192kHz, the listener has the impression of being in the violinist’s immediate vicinity. Anne-Sophie Mutter also takes a keen interest in alleviating medical and social problems of our times. She supports various causes through regular benefit concerts. Thus, in 2018 she performed for the Barenboim Foundation, the Anne-Sophie Mutter Foundation, the Romanian orphanage in Victoria, the Hanna and Paul Gräb Foundation and for the renovation of the church organ in the parish church St. Rupert in Oberaurach (Austria). In June 2019 she will receive the Polar Music Prize. Poland awarded the Gloria Artis Gold Medal for Cultural Achievements to Anne-Sophie Mutter in March 2018, making her the first German artist to receive such an honour. In February 2018 she was named an Honorary Member of the Accademia Nazionale di Santa Cecilia. Romania awarded the Order of Cultural Merit in the rank of a Grand Officer to Anne-Sophie Mutter in November 2017; during the same month France honoured her by presenting her with the insignia of a Commander of the French Order of the Arts and Literature. In December 2016, the Spanish Ministry of Education, Culture and Sports awarded her the “Medalla de oro al Mérito en las Bellas Artes” (Gold Medal for Merits in the Fine Arts). In January 2015 Anne-Sophie Mutter was named an Honorary Fellow of Keble College at the University of Oxford. In October 2013 she became a Foreign Honorary Member of the American Academy of Arts and Sciences, after winning the medal of the Lutoslawski Society (Warsaw) in January. In 2012 the Atlantic Council bestowed the Distinguished Artistic Leadership Award upon her. In 2011 she received the Brahms Prize as well as the Erich Fromm Prize and the Gustav Adolf Prize for her social activism. In 2010 the Technical-Scientific University of Norway in Trondheim bestowed an honorary doctorate upon her; in 2009 she won the European St. Ulrich Award as well as the Cristobal Gabarron Award. In 2008 Anne-Sophie Mutter was the recipient of the International Ernst von Siemens Music Prize as well as the Leipzig Mendelssohn Prize. The violinist is has been awarded the German Grand Order of Merit, the French Medal of the Legion of Honour, the Bavarian Order of Merit, the Decoration of Honour for Services to the Republic of Austria, and numerous other honours.